Peanut Butter No Bake Cookies are an easy classic the whole family will enjoy! They’re made with just 6 ingredients and only take a few minutes! 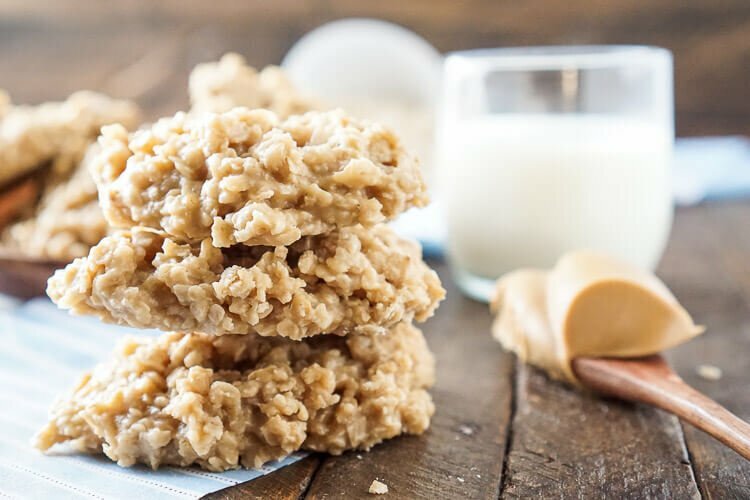 Peanut Butter No Bake Cookies are absolutely addictive, there’s just something about the mix of hearty oatmeal and sweet sugar with salty peanut butter! 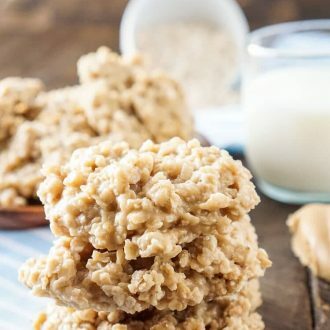 I love how fast you can whip them up too, just a few minutes on the stovetop, then plop them down on some wax paper and let them harden, or don’t, and don’t forget to lick the spoon that’s now caked in peanut butter and oatmeal sugary goodness! Don’t forget to try my Irish Cream No Bake Cookies or Pumpkin No Bake Cookies too! JUST TAKE ME TO THE PEANUT BUTTER NO-BAKE COOKIES RECIPE ALREADY! If you’d rather skip my (very helpful, I think) tips and tricks, essential cooking info, and similar recipe ideas – and get straight to this deliciously easy Best Ever PEANUT BUTTER NO-BAKE COOKIES Recipe – simply scroll to the bottom of the page where you can find the printable recipe card. Happy National Peanut Butter Day! What are you doing to celebrate? Eating LOTS and LOTS of peanut butter, I hope! And you should most definitely make sure these No Bake Peanut Butter cookies are on the agenda! When I was growing up, peanut butter no bake cookies were such a novelty to me. I mean, we all know about the chocolate ones, but it was SO CRAZY that all you had to do was leave out the cocoa powder and BAM! Peanut Butter! 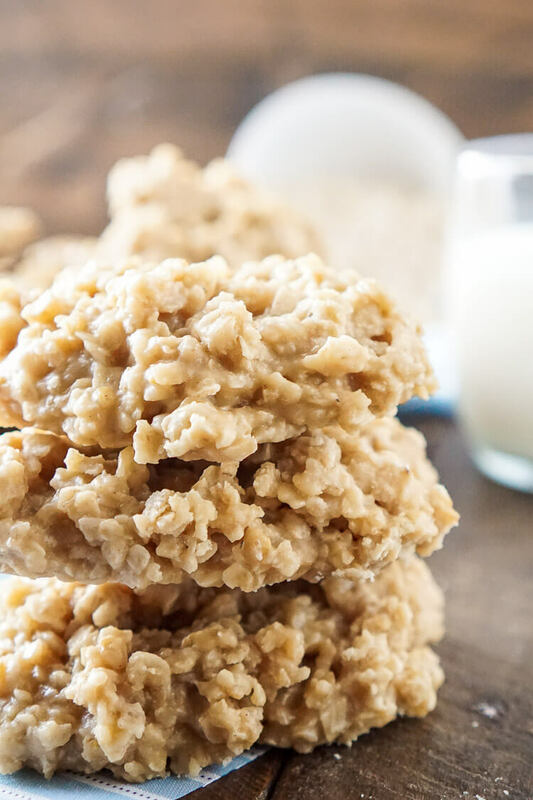 To this day, no bake cookies are still one of my favorites in almost any flavor, there’s just something about the quick punch of sugar mixed with some hearty oatmeal! Minute Oats! Regular Old Fashioned Oats will not yield great results, you need to use 1-minute oats in order to have a more tender and chewy cookie. Add the vanilla AFTER boiling! You want that vanilla flavor, so don’t cook it off during the boil, add it at the end! Rolling Boil! You need a rolling boil for 2 minutes, not a simmer, don’t start the timer until it’s super bubbly! Creamy OR Chunky! You can make this with chunky peanut butter too for extra peanut crunch! Pin these Peanut Butter No-Bake Cookies for Later! 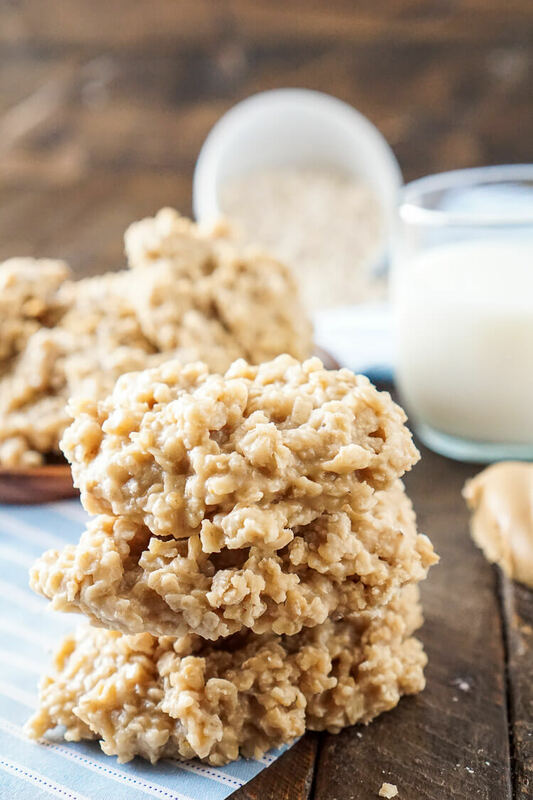 These Peanut Butter No Bake Cookies are an easy classic the whole family will enjoy! They are made with just 6 ingredients and only take a few minutes on the stove top to make! Combine sugar, butter, and milk in a medium saucepan over medium heat. Stirring occasionally, bring to a boil and let boil for 90 seconds. 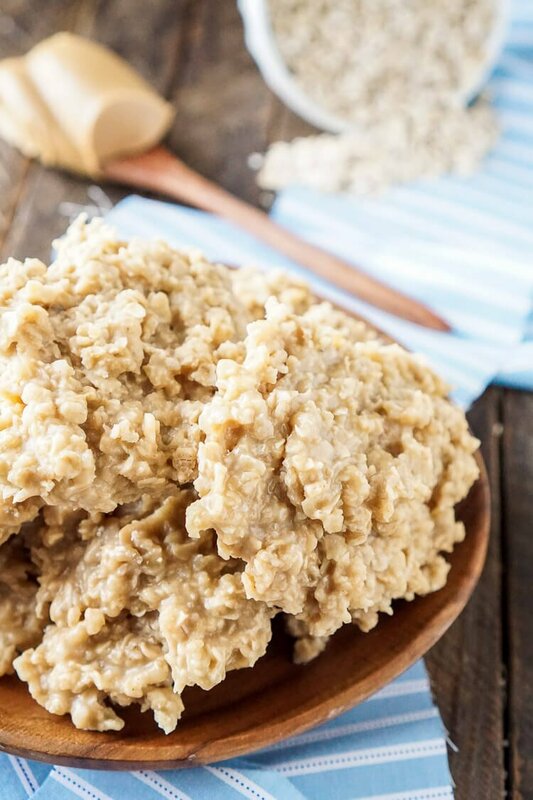 Remove from heat and stir in oatmeal, peanut butter, and vanilla. Creamy or crunchy peanut butter can be used. These look awesome and I appreciate all your tips! Peanut butter cookies are my fav! No Bake is perfect for this time of year! These would be a hit at my house! I love how these are no bake! Such a good addition to the classic! Hi lele, you should use 1-minute oatmeal which comes in a canister. Do not use the instant oatmeal that comes in little packets. Those won’t work. Flavor is good, but cookies are waaay too dense. I only put in 2-1/4 cups of the Quick oatmeal, but it made the cookies very dense and dry. I don’t think you could even stir the mixture with the full 3 cups of oatmeal in it that it calls for. I will probably just find a different recipe, or IF I try these again, I’ll reduce the boiling time a bit, and also reduce the amount of oatmeal to about 1-3/4 cups. 4 tablespoons as listed in the recipe card.